SBS Inkigayo Super Concert is set to take place on 28 April at Gwangju World Cup Stadium with line-up consists of BTS, MOMOLAND, IZ*ONE, TWICE, TXT, The Boyz, Cherry Bullet, Hong Jin Young and more. Exclusively for Malaysian K-POP fans, Korea Tourism Malaysia (KTO MY) are giving out a total of 250 concert tickets for FREE for those who are travelling to Korea during the concert period. How to Get the FREE Tickets? Fill in the survey HERE and upload a copy of your flight itinerary, passport and singned Participation Acknowledgement Form. *Note: A confirmation email will be sent to the winners from KTO MY latest on 23 April 2019. 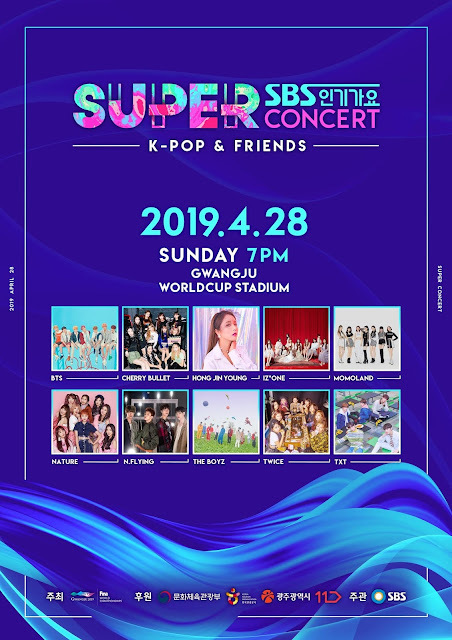 Confirmed line-up: BTS, BTS, MOMOLAND, IZ*ONE, TWICE, TXT, The Boyz, Cherry Bullet, Hong Jin Young, N.Flying, Nature. For more information about the contest, visit HERE.